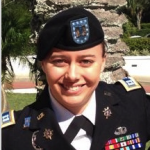 Ashley graduated from the United States Military Academy in 2009 with a B.S. in Sociology. She commissioned as a Military Intelligence Officer and was stationed at Joint Base Lewis McChord as a member of 4-2 SBCT. She was deployed to Afghanistan in 2012-2013 as a Female Engagement Team member and Brigade Assistant Intelligence Officer. After leaving active duty in the spring of 2014, Ashley joined Teach for America as a high school mathematics teacher in San Jose, CA. During her time in the classroom, she also completed a Masters of Education in Policy and Administration from Loyola Marymount University, Los Angeles. Ashley is a J.D. Candidate at Georgetown University Law Center and a member of the GULC Global Law Scholars Program. Ashley is a 2016 Pat Tillman Foundation Scholar.